Successfully manage large scale thermoluminescence dosimetry (TLD) lab operations with an automated solution to monitor every employee. The Thermo Scientific™ Harshaw™ TLD Model 8800 Plus Automatic Card Reader provides high-capacity evaluation of whole body, neutron and environmental TLD cards and extremity dosimeters on carrier cards. Designed for large facilities requiring high-volume personnel monitoring, the field-proven Harshaw TLD Model 8800 Plus system reads a carousel containing up to 1400 four-element cards at 140 cards per hour. A unique chain-of-custody tracks and maintains records. The Harshaw TLD Model 8800 Plus Automatic Card Reader is controlled through screen dialogues, using the mouse to make selections from the drop-down menus. It can also be networked with Thermo Scientific™ Harshaw TLD™ Model 4500 Manual Reader and Thermo Scientific™ Harshaw TLD™ Model 6600 Plus Automated Reader in discrete or shared dosimetry applications. Measures beta, gamma, X-ray and neutron doses, singly and mixed. Card readout has been accelerated up to 140 cards per hour. Thermo Scientific™ EXT-RAD and Thermo Scientific™ DXT-RAD extremity dosimeters are also processed automatically on carrier cards. Element Calibration Coefficients (ECCs), Reader Calibration Factors (RCFs) and card acceptance procedures are controlled by a new automatic QA program. Precisely controlled heating profiles offer consistent, repeatable glow curves, suitable for further analysis; precise, highly controlled, highly reliable linear heating by gas produces uniform heating, provides better reproducibility and extends dosimeter life. Host computer with VGA color monitor. Explicit on-screen text — no cryptics. The photomultiplier tube assembly is accessed for inspection or cleaning, as required, via a small clean-out drawer; carousels and clean-out drawer are accessible through hinged panels in the cover. Precise flow of hot gas to the four heater tubes for the TLD dosimeter elements is controlled by four precision flowmeters adjusted and balanced during factory setup. High-voltage potentiometers are mounted within the reader, allowing precise adjustment. Back panel controls include a keyboard enable/disable switch and connectors for keyboard, mouse, screen, serial port, and parallel printer port. Optional UPS prevents loss of data during power failures. Standard version, reads Harshaw TLD whole body, neutron and environmental TLD cards and extremity dosimeters on carrier cards. Includes reader, heating system, load and unload cartridges, card transport system, and single barcode reader. 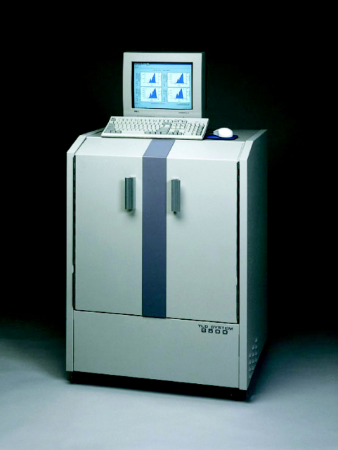 Thermo Scientific™ WinREMS™ Software runs on a separate external PC. Same as standard model, but includes a triple-head laser barcode scanner for reading EXT-RAD extremity chipstrates. Same as standard model, but includes a CCD camera for reading DXT-RAD extremity ringlets, EXT-RAD chipstrates and other standard Harshaw TLD cards. Note: No annealing required; anneal part of the heat cycle can be used to remove residual signal after exposure to a high dose.